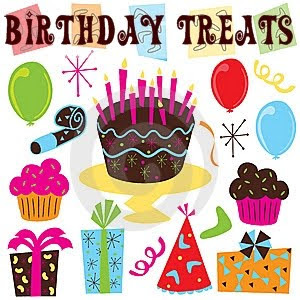 Growing up, my favorite day of school was the day I got to take treats for my birthday! My mom would always bake a special treat that I loved sharing with my friends! 1988...sporting some double looped pearls! Maybe I should have looked into a career with Premier! also to add to your list for kids. at incredible pizza if it is the childs birthday they get a sticker to wear that says its their bday and a little goody bag of cheapy toys. and they get to spin this wheel and get various prizes depending on what they land on like $10 gamecard or 100 extra tickets to buy prizes. Abby--I think I'll take your idea and lobby for a week of eating out! I usually get all the free coffee drinks and use the free ice cream treats for the kids! i actually like incredible pizza better than chuck e cheese. and it is a christian company. they have up on their wall that they are and the manager is really nice. but i totally understand the germ thing! 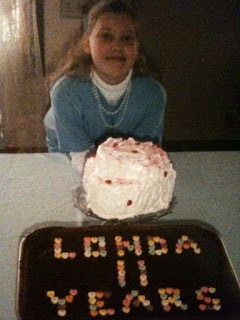 Hey Londa- I'm Brien Brough's sister... I met you a few times at FBC and Bass Lake Camp. I found your blog through Katie Brook's blog. Oh!! And FYI... Timberlodge Steakhouse gives you a $10 coupon on your birthday, too!! Thanks for all the links! I'm gonna get a little click happy and start signing myself and the whole fam up now! WOW!! You rock... thanks for all the great info... Yeah Birthdays!! Happy Birthday Londa! Hope the roads are ok so you can get out and take advantage of some of your free birthday things!